Politics is a tough business, even for an ex-territorial paratrooper, business owner and former accountant, Andrew Bayly. 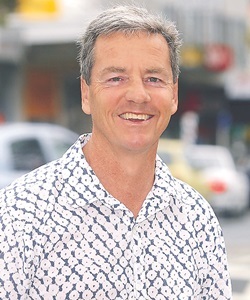 More than a year on from sweeping to victory in Auckland’s Hunua seat at the 2014 general elections, Andrew answered a few questions about his life representing the man on the land. -How have you settled in as a new man in parliament? I’ve settled in well. It’s great to be working for the people of Hunua locally as well as being the elected representative in the capital. It is intellectually stimulating. -Is politics proving more thrilling than the dizzying world of accountancy? It’s different. I look back at my previous career as something I enjoyed, but now I’m in a totally different role, with all the intellectual stimulation that brings. It is, however, good to be able to draw on my business experience here in Parliament. There are few MPs with long-term business backgrounds. -Which portfolio would you most like? Any aspirations to one day switch the letters ‘MP’ around to read ‘PM’? I’ve always been interested in finance and our environment in particular. I would certainly have an interest in being involved in a finance capacity. However, in politics you have to be ready for whatever challenges and positions come your way – they may not always be in your comfort zone. As to the second, I’m only a year into this job. Far too early to look into the crystal ball, I’d say! -When and why did you decide to throw your hat into the ring and join the political circus? I always wanted to be an MP. However, I had decided that I only wanted to represent the area where I live and have an association. When Dr Paul Hutchison decided to step down, my wife and I visited numerous people throughout the electorate to find out what they were wanting in their next representative. Following this, I put my name forward and was lucky to be the one selected. Following any MP who has occupied the seat for 15 years is a hard act to follow. However, I am fortunate that one of Paul’s key staff members stayed on to work in my Pukekohe office, which offers some continuity. -Despite being a new candidate, you claimed more than 67% of the Hunua vote. However, in day to day politics does size (of majority) really matter? Under MMP the really important number is the party vote. However, being the elected member in the fourth-highest polling electorate seat certainly offers its advantages and is a privilege. I would say, from an electorate perspective, I never regard myself as a National MP. I’m here to represent everyone in the electorate, whatever their allegiances. -Having trekked to the South Pole, climbed mountains (in New Zealand and Antarctica) and competed in Coast-to-Coasts, marathons and Ironman events, what is the essential element in mastering a challenge? All these various pursuits have their elements that test you. The common theme to succeed is, however, always the same. Be well prepared, work hard and, perhaps most of all, have a sense of humour. -Is politics more a sprint or does it require marathon men? Definitely a marathon. When you first become an MP, nobody gives much credit for what you may have done before. You need to earn respect. I’ve set aside 15 years to run this one. -Roman statesman, Cicero, said: “Politicians are not born; they are excreted.” Fair comment? I prefer one of his other quotes: If you have a garden and a library, you have everything you need. -If you could be Prime Minister for one day, what would you do first and why? My first visit would be to the Hunua Electorate to thank everybody for their support! Where else would you possibly go? -If you could invite any politician/statesman/world leader (living or dead) to dinner, who and why? Winston Churchill. A man of much energy, having been a soldier, correspondent, sportsman, artist, author and politician. What a fascinating evening that would be!